When you’ve got your heart set on buying an SUV, you also need to take insurance costs into consideration. According to the Insurance Information Institute, the average American driver spends about $850 per year on automobile insurance. But what you pay also is determined by the type of vehicle you buy, your age, driving record, number of miles you drive each year, where you live, and amount of coverage. Since this is about the cheapest SUV to insure, here are three of the least expensive 2009 SUVs to insure. They are the top three vehicles listed from Insure.com, but some of them also appear on other lists, such as AOL Autos. Hyundai Santa Fe – The midsize crossover SUV Hyundai Santa Fe is now in its second generation, with new design in 2007. Edmunds says Santa Fe is “high on value, safety and amenities…a very good choice for a midsize crossover SUV.” Car and Driver says the Santa Fe “is about as large as key competitors such as the Honda Pilot and the Toyota Highlander…like the rest of Hyundai’s lineup, it’s a good value.” U.S. News and World Report says Santa Fe is a “value-priced family hauler…that delivers safety and value, but can’t match the performance of competitors.”The Insurance Institute for Highway Safety (IIHS) named the 2007-2009 Hyundai Santa Fe a Top Safety Pick in the midsize SUV category. 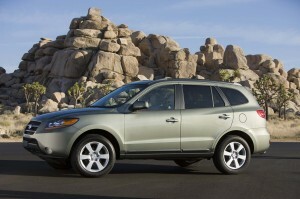 According to Insure.com, the average premium for the 2009 Santa Fe is $832. Kia Sportage – Corporate twin to the Hyundai Tucson, the Kia Sportage, according to Edmunds, has “a generous equipment list and an affordable price [making it] it a value leader among compact SUVs.” While Edmunds says “performance and fuel economy trail those of most competitors,” Sportage also has an “impressive” 10 year/100,000 mile powertrain warranty. U.S. News and World Report calls Sportage “a great value in its class.”With antilock disc brakes, traction control, stability control, front-seat side airbags and full-length side-curtain airbags standard, the 2006-2009 Kia Sportage earned a five-star rating in the National Highway Traffic Safety Administration (NHTSA) frontal and side-impact crash tests. Insure.com lists the average premium for the Kia Sportage (2009 model) as $840. Saturn Vue – The second-generation 5-passenger Saturn Vue, introduced in 2008, “is a remarkable improvement over its forbear, looking and feeling like a European-designed car that just happens to have Saturn badges,” says Edmunds. U.S. News and World Report says Saturn Vue “offers one of the best combinations of style, a comfortable interior and impressive performance in its class.” Saturn Vue is another of the 2008 and 2009 IIHS Top Safety Picks in the midsize SUV category. How does the Saturn Vue stack up in average insurance premium? According to Insure.com, the 2009 model averages about $911. Other cheapest SUVs to insure include the Honda Pilot, Hyundai Veracruz, Jeep Patriot and Wrangler, Land Rover LR3, Mazda Tribute and Subaru Forester.